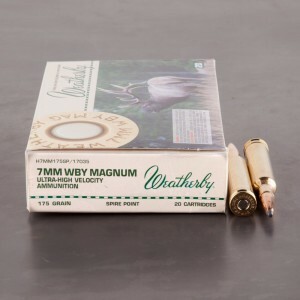 7mm Weatherby Magnum is a potent and powerful 7mm projectile that is chambered in Weatherby’s Mark Five rifles. The round was designed by Roy Weatherby in 1940 as a Weatherby proprietary round and is capable of taking a wide variety of game including medium-to-large-sized game. The round is even capable of taking American Bison and bear. At long distances, 7mm Weatherby Mag ammo retains excellent ballistic coefficients that allow the round to deliver excellent long range performance. Expect muzzle velocities of up to 3,000 feet per second with a 154 grain round. The 7mm Weatherby magnum can fire a variety of different bullets, and can be loaded from 120 grain to 175 grain, with velocities ranging to 3,240 feet per second with lighter bullets. Like most weatherby rounds, this cartridge is a premium load for the very discerning shooter.